Recently, I’ve been following some really interesting discussion on the “You Know Your from Lowell When” Facebook group. 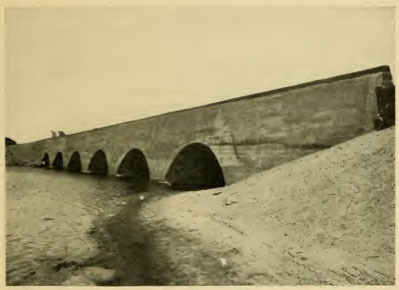 It’s been about Wigginville, the South Lowell neighborhood that’s probably better known for its local landmarks: the Six Arch bridge, Riverside School, and the Dizzy Bridge – that ancient footbridge that doubles as a teenage dare/deathtrap and runs roughly parallel to Lawrence Street on the opposite side of the Lowell Cemetery. The thing about Wigginville is that it’s one of those places where, even if you grew up there, or even spent your entire life there, you may not have noticed that you were standing there, smack in the middle of it. I heard passing references to it, growing up in South Lowell, where it was almost always referred to as “Wigginsville”, which, surprisingly, isn’t actually the right pronunciation. Sure, Lowell still has its neighborhoods, even today. There’s Centralville (always pronounced, but rarely spelt Centerville), Back Central, Pawtucketville, Belvidere, and the Highlands. There are some smaller, older neighborhood names that have sort of clung on, over the years. Belvidere contains the neighborhood once better known as Lowell’s Oakland section, which still survives at some level, in the name of the former fire station across the street from Shedd Park. There’s also Ayers City, which has best survived in the sign at the end of the Lowell Connector’s Exit 4. If you look closely, you’ll see that the sign contains a misspelling, calling it Ayres City. Go back a century, though, and you’ll find many more neighborhoods. 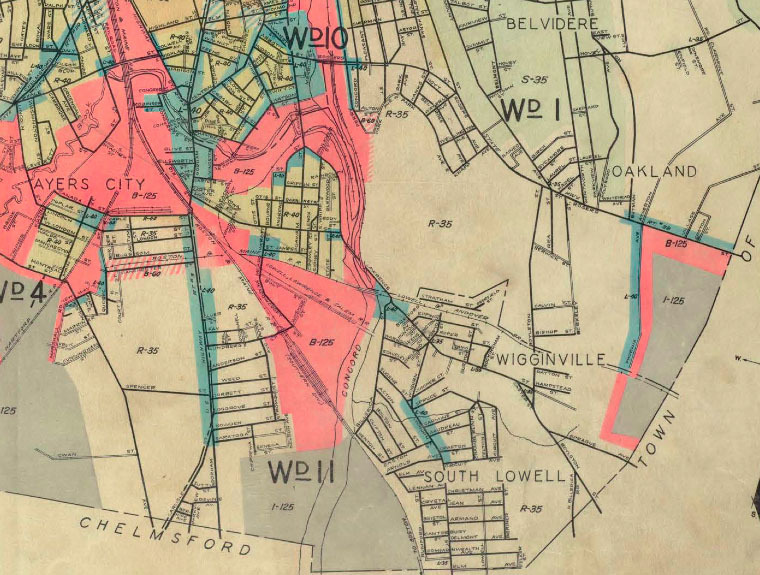 Lowell’s South Lowell neighborhood, for example, once contained the Bleachery, the Grove, Riverside Park, Swede Village, and Wigginville. This 1936 map shows several of Lowell’s southeastern neighborhoods, including Wigginville. For a neighborhood name that’s been largely forgotten, Wigginville sure created quite a stir in city politics when one Councilman Wilde proposed changing its name in 1908, not even two years after it had been annexed from the neighboring town of Tewksbury. Echoing what was the general feeling at the time, his argument followed that anything annexed to Lowell from a surrounding town had to be upgraded so that it met the city’s standards and didn’t embarrass the citizenry. Wigginville, according to Councilman Wilde, did just that. First and foremost among his concerns, there was the matter of its name. Wigginville had landed upon its name as a sort of dedication to its largest developer, William H Wiggin. Wiggin had been a well-known builder in the Lowell area, contributing his efforts to such lofty and well-respected edifices as the Savings Bank Building, the Boston & Maine depot on Central Street, and the Armory on Westford Street. And, in the nineteenth century psyche, he was a valued and solid member of society. He had been born in Epping, NH in 1823, went on to graduate from Dracut Academy, and had even had the time to trace his ancestry to the pilgrims. And he had, in the words of his supporters, developed the “beautiful suburban village” of Wigginville. Councilman Wilde was not among his supporters. Councilman Wilde also didn’t have the best sense of timing. He chose 1908 to change Wigginville’s name. Yes, that was about two years after the neighborhood had become part of Lowell, but it was also just after William H Wiggin had died. 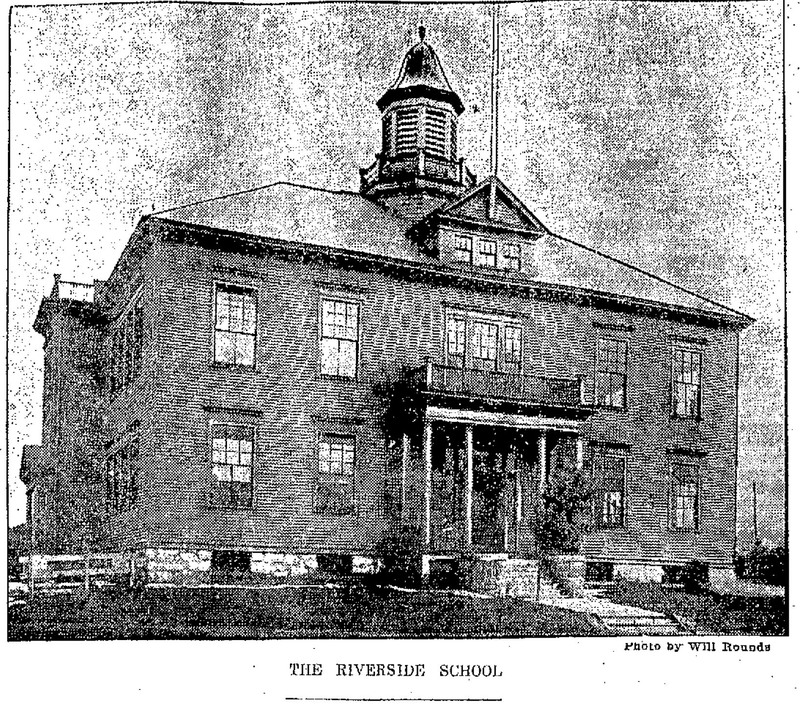 Those who had grown up appreciating Wiggin’s contributions to the cityscape, and may have even attended the Riverside School he had funded and helped build, felt that the neighborhood should not be stripped of his name. In fact, they said, Wigginville should retain his name, as a memorial to his good deeds. Wiggin’s supporters found their champion in Richard Sykes, ‘the man with the Mountain Lion’s voice’ from Wigginville. Councilman Wilde had his supporters too. There wasn’t even an appropriate entry into Wigginville, they reasoned. Lowell city councilmen looked at the Lawrence Street bridge spanning the Concord River as a ramshackle pathway, perilous even to foot traffic, let alone horses. Now that it was part of the city, it had to be dealt with, they claimed. And, this, of course, took the conversation back to its name, Wigginville. Who would want to enter a neighborhood named Wigginville? they asked. A 1908 Lowell Sun article purported to ask a resident of Wigginville, unnamed, what he thought of his neighborhood’s name. He claimed that he thought the name should be changed, so that electric car riders would no longer be embarrassed to board cars bound for “Wigginville” – if riders could even heard the conductor’s destination announcements over the snickers. The name should be changed, this unnamed man (or woman) on the street claimed. He went on to say that he had found that this opinion was shared by a three-to-one margin among his fellow Wigginvillians. Wigginvillians were so ashamed of the Wigginville name that they had been seen clandestinely boarding electric cars to the nearby Bleachery station, just to escape the snickers meant for the Wigginville car. And, then there were the comedians too, the man on the street continued. They were ‘always’ cracking jokes at the cost of the poor Wigginvillians. 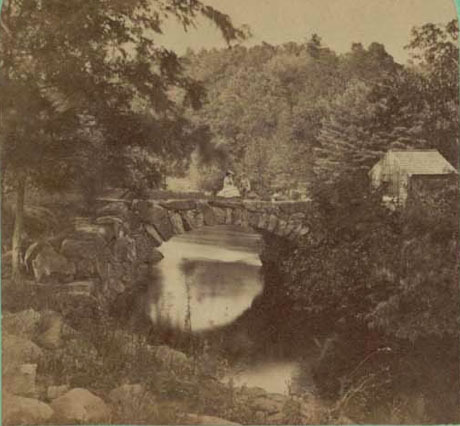 A 19th century view of an earlier Lawrence Street bridge that spanned the Concord River. The problem of what Lowell city residents should call these new neighborhoods was a cause of confusion too. The deeds for these newly annexed lands carried all sorts of arbitrary, vaguely defined and unfamiliar neighborhood names, based on the many developers who had built up the area in the last couple of decades. A quick review of the deeds had turned up not just references to the unfortunately named Wigginville, but also to places called Lee Village, Gilman Hill, and Riverside Park. It just made sense to unite the rural territory under one suitable, nicely sounding name, supporters of the name change claimed. So, what should the name of this section be? 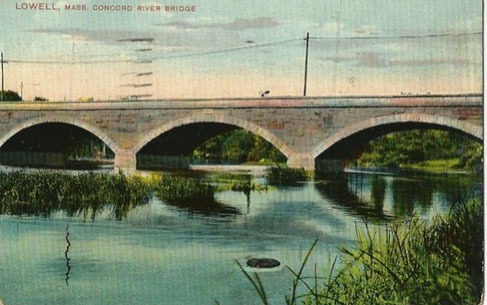 Councilman Wilde proposed changing the name of Wigginville to Concord Heights, after the name of the nearby Concord River. This name would assuage the bruised egos of Wigginvillians, and even begin to rehabilitate this poor no-man’s-land into a proper city neighborhood. Lowell would, finally, be able to hold its head high with Concord Heights, its newest neighborhood. It was hoped, he said, that the name change would encourage the Boston & Maine to improve its station stop in Wigginville (near the present-day park off Commonwealth Avenue) and help the Primitive Methodist Church being constructed on Lawrence Street to finish its construction without having to wonder how to name itself around the unfortunate Wigginville neighborhood. Councilman Wilde seemed to have all of his supporters in lock-step. All that was left to do was put the Wigginville renaming proposal in front of the Board of Aldermen. And he did, in July 1908. And, on that night, Richard Sykes, the Mountain Lion’s Voice from Wigginville, came, ready to argue his neighborhood’s stance that the name not be changed. He had prepared a speech in defense of a memorial to the neighborhood’s benefactor, William H Wiggin. Local press came too, ready for the show. They quipped amongst themselves that he would present his argument there in the chamber, and would have his “janitors around with baskets picking up his dropped h’s.” Wilde started by presenting a petition, said to be signed by some 100 Wigginvillians, to change their village’s name to Concord Heights. The aldermen listened, briefly. Wigginville barely registered in their minds. The neighborhood, annexed less than two years before, didn’t even have defined borders. Chairman Wilder spoke first. He wondered why all the fuss was even worth their time. The name will die out, Wilder told Wilde, since it came from Tewksbury, and Wigginville was clearly now a part of Lowell. His fellow aldermen listened, and joked that perhaps Wigginville should be renamed Wildeville. Another alderman claimed that Wild Wigginville might be even more appropriate. Richard Sykes prepared to speak. There was no need to fear Sykes, or his speech though. When the motion to change the name was presented, Aldermen Brennan and Gray disposed of it almost immediately, telling Wilde, whose smile must have been fading by then, that the Council had no role in naming, or re-naming Wigginville, since the name had never actually been assigned. The fact was, they said, that the residents themselves had just decided that that was how they wanted to name their neighborhood, and the Council was just fine with that. They then moved the topic of discussion to something that the “Council had something to do with”. They appropriated funds to fix that Concord River bridge so badly in need of repairs. And the proposal to change the village’s name from Wigginville to Concord Heights seems to have died right there, on the chamber floor, because, as they moved on to the matter of that Wigginville bridge, not one voice was raised in protest, because the people of Wigginville were just fine with their neighborhood’s name, and didn’t want someone with very little connection to Wigginville renaming their community. In the weeks following the decision, or non-decision at it may be, the Wigginvillians took the momentum from their victory and formed the Wigginville Improvement Club, and elected Richard Sykes as its president. The objective of the club? To improve the village’s streets, and to perpetuate the proud, newly vindicated name of Wigginville.